You can create an account and authenticate to the OTC system using the standard bitcoin client we all know and love. In short, all you need to do is sign a one-time-password message using a bitcoin address of your choice, and submit the signed message to the bot for verification. The guide below contains a more detailed walkthrough of the process. You can also talk to the bot in private message to avoid cluttering up the channel - which you are recommended to do for the purposes of authentication and registration. To start a private session with the bot, type "/query gribble" in your IRC client. When in PM, there's no need to prefix your commands with ";;". The first step is to download and install the bitcoin client. You can do so at http://bitcoin.org. Most of you will probably already have the client up and running. Once the client is up and running, it is recommended to create a new bitcoin address that you will use to authenticate to #bitcoin-otc. On the "Receive coins" tab, click the "New address" button, and label it with something that you'll easily recognize (e.g., "bitcoin-otc signing address"). At this point, if you don't already have multiple, secure, and geographically dispersed backups of your bitcoin wallet, you should make them. Note: if you are already registered via GPG authentication, use the 'changeaddress' command to add a bitcoin address to your otc account. Now, continue to the Challenge-response section. 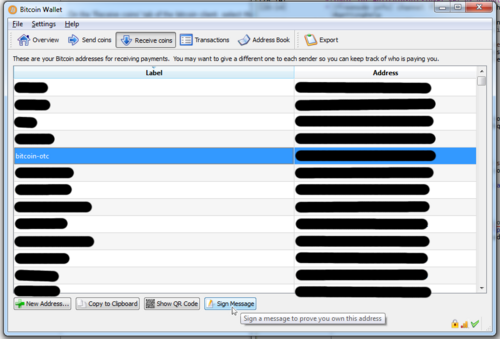 The bitcoin-qt Receive coins panel with 'sign message' button highlighted. If all goes according to plan, you should receive a success message and you'll be good to go! To change your registered address, (or to add one if you have registered via GPG and don't have an address on file) use the 'changeaddress' command with the new address you wish to use. You must be authenticated to your account in order to use the command. Once you issue the command, the bot will supply you with the challenge that you must sign with your new address and respond with the bcverify command, in the same manner as for normal authentication. This page was last modified on 22 August 2012, at 08:33.